We all love and hate shopping during the holidays, and it’s important to shop both safely and affordably during the season. Here are some ways to stay focused to keep you and your budget in-check this holiday season! The National Retail Foundation’s annual survey shows that holiday spending is at an all-time high. Americans spent 3.8% more last year over the year before (to the tune of $601.8 billion total). November and December spending last year totaled 19.2% of annual sales nationwide. This is our national spending forecast — what we can expect if we “go with the flow.” The good news is, unlike with our local weather forecast, we can change our personal holiday spending forecast if we resolve to do things differently this year! 1. Coupon for holiday “varieties” of regular household items. It’s always nice to have holiday-themed paper goods, towels, candles and other festive items on hand for guests and visiting relatives. The good news with these items is that, unlike strings of lights and mistletoe, if you have extras you still can use them all year long. Tea lights and candles: So long as you enjoy the scents, you can use these all year. Note: If you dislike using holiday themed items after the holidays, then opt for holiday solid colors (red, green, blue, white, etc.) so if you have extras to use up, they won’t be so noticeable. 2. Consider hosting an in-home sales event to reduce the cost of gifts for everyone. If you have a friend who is an independent sales rep for a popular line of jewelry, accessories, kitchenware, skincare or scrapbooking supplies, consider hosting a pre-holiday party in your home. You’ll save on gifts and so will your friends — and your sales rep friend will make their holiday quota! Deeper discounts on your purchases (Discounts typically escalate with higher totals on party purchases). 3. If you can’t find the item at the price you want, go ahead and wait it out. You just never know what the holiday shopping mania will bring. If there’s an item you want but the price isn’t right, don’t buy it. What to do: Wait…chances are the price will not go up before the holidays arrive in earnest, and it might decrease as merchants become more eager to move their holiday inventory. A “door buster” is a marketer’s term for a low-priced item that is so enticing, it can bring customers to the store all by itself. But experts caution against assuming that just because an item is advertised at an “all-time low” for that store, do not assume that is the lowest price you can find! What to do: Use your price comparison tools and coupons to “challenge” that price—see if you can find the item for lower somewhere else. Download the “ShopSavvy” app to scan an item and see other prices at surrounding stores! 5. Wait for holiday clearance sales to start. Traditionally, many merchants begin their holiday clearance sales right before the holidays actually begin. Once the clearance sales start, prices on those items will continue to decline until the inventory is all gone, or the new sales cycle starts. What to do: Research when your favorite merchants will begin their clearance sales (often you can find this by signing up for their email newsletters or following them on social media). Then plan your shopping accordingly. 6. Watch social media for “flash” coupons, deals and offers. As we become increasingly social media-driven, merchants are using the power of free social media-based advertising to draw in customers. What to do: For items you really want, be sure to follow those merchants on Facebook and Twitter (you can set up your social media accounts so they deliver alerts as they happen to make sure you don’t miss an offer). Also be sure to sign up for Amazon’s Lightning Deals. 7. When asking for price matching, don’t forget about online store offers. During the holiday crush, many brick-and-mortar merchants rely on holiday sales to close out the year in the black. (Remember, 19.2% of all annual spending happens in November and December!). So not only will many retailers offer price matching guarantees, but often these apply to competitors’ prices both online and offline. What to do: If you see a low price online offer, bring in the proof and ask the merchant to honor it. 8. Sign up for the holiday store credit card and promotional offers. Nearly 20% of annual purchases are made during the holidays, so the holidays represent a merchant’s best chance to attract new customers and build long-term customer loyalty. So prepare for retailers to compete by offering mouth-watering incentives to sign up for their in-store promotional offers, including freebies with purchase, discounts when signing up for a new line of store credit and more. What to do: Take the offers, discounts, deals and freebies! Pay for what you owe, then stash those cards away until the holidays arrive again (or even better, cut them up so you won’t be tempted). Click here to view the original article source courtesy of thekrazycouponlady.com. It is hard to believe, but the holiday shopping season is here. If you’re like most families, holiday shopping can be a strain on the budget. 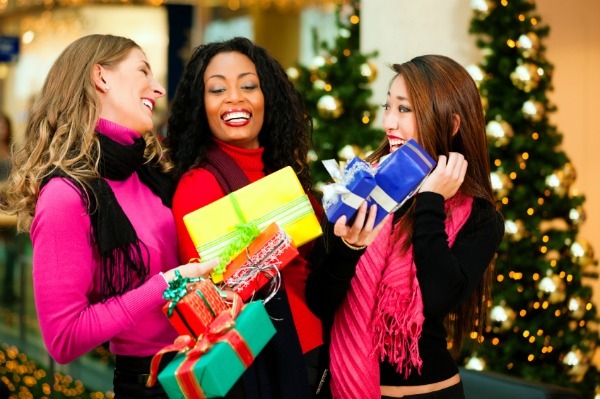 Many shoppers also fear looking cheap when passing out gifts, which can lead to over-spending and blowing the budget. According to the American Research Group, Americans on average spend $801 on Christmas shopping. That kind of number will have a big impact on a budget. If you’re looking for ways to cut down the cost of holiday shopping and still get great gifts, these tips will help. The best way to save money on holiday shopping is to start early. There is a belief that the best deals are available around Black Friday, the day after Thanksgiving, and that is not always the case. Instead of waiting, be on the lookout for even bigger deals that might be hitting stores sooner. The ever expanding influence of online shopping has moved many retailers to begin pushing major holiday campaigns back as early as Halloween, if not earlier. The added benefit is being able to avoid the craziness that Black Friday shopping brings. It might not be too common, but shopping at discount or Dollar stores can be a great way to shave some spending off of your gift budget. You might not find your gifts there, but you can probably save on other holiday-related items, such as wrapping paper, gift bags and decorations. While they might not have good options for a traditional gift, Dollar stores can be a great option for gag gifts, office Christmas parties and white elephant gift exchanges. Beyond that, Dollar stores are a useful alternative for party favors or decorations for parties you may be hosting. Since many of those items will likely be thrown away anyway, there is no point in spending more than you need to. Price matching has become increasingly expected as many brick and mortar retailers deal with the presence of online shopping. While not every store offers price matching, it can be a great way to save money when added to your shopping strategy. The trick is to know the terms and conditions of the given retailer you’re shopping at. Some will match any retailer while others will not match online-only retailers. If you have a smartphone, bring it with you when you go shopping. There are many apps available now, from Amazon to others, which allow you to scan the item to see what is charged for it elsewhere. Add that to your arsenal to save money while shopping. Lastly, make sure to check the retailer’s site itself to make sure it’s not offering a cheaper price online than in-store. If you find a discrepancy, you can always ask for a price match, or at least allow a free shipping option. Like the Dollar store option, daily deal sites may not be commonly thought of as options for gift shopping but they can be a great way to save money. Many daily deal sites regularly sell significantly reduced deals for national retailers that can be great options for presents. They might also give you ideas for items that you can then go track down in local stores. The problem with daily deal sites is they have a limited window in which you can get the deal. This can definitely pose a problem when shopping for that special someone. However, there are options available if you missed out on the deal you were looking for. CoupRecoup, for example, allows those who have bought deals they’re unable to use to sell them. This can be a great way to potentially score a deal on an item you were looking for. The holiday shopping season can be a stressful one, especially on a tight budget. By using some simple tips like the ones mentioned above you should be able to shave some money off your holiday shopping budget, and maybe even have some leftover for yourself. Make gifts merrier with First Financial VISA® Gift Cards! Available in denominations of $20 to $500, a First Financial VISA® Gift Card* is the perfect gift for anyone on your holiday list at a small cost of $3.95 per card. *If the gift card is inactive for 360 days, an inactivity fee of $2.50 per month will be charged to the card – starting from the date of activation. If the card is lost or stolen, the replacement fee is $15.00. **A $5 deposit in a base savings account is required for credit union membership prior to opening any other account. All personal memberships are part of the Rewards First program and a $5 per month non-participation fee is charged to the base savings account for memberships not meeting the minimum requirements of the program. Click here to view full Rewards First program details. Accounts for children age 13 and under are excluded from this program. Click here to view the original article source written by John Schmoll of U.S.News. Want to buy for everyone on your holiday list, but don’t want to go broke while doing so? Here are some tips to keep your holidays fun yet affordable! Make a list. Many people spend as they go, buying presents when they see them and end up surprised when the bills arrive in January. You can avoid this problem by creating a list in advance of who you plan to buy gifts for, and you should budget for each. Then, check this total against your holiday savings to decide if you need to adjust your spending. Be creative. As you begin your shopping, remember that thoughtfulness really does count. Instead of searching for one expensive present, you may be able to save money, and give the perfect gift, by putting together a number of small items that relate to a loved one’s special interest. Someone who truly loves chocolate, for example, might appreciate a small basket full of treats you’ve chosen for them. Anyone with an interest in sewing or crafts could probably use a gift bag with a fresh stock of supplies for the new year. By putting together a lot of inexpensive items, you may be able to save money and show how much you care. Hit the kitchen. If you are a good cook, or you simply have a foolproof recipe, gifts of food are inexpensive and very popular. Whether you give a mixture of great holiday cookies or your grandmother’s prize-winning banana bread, your friends and family are sure to welcome the effort. In fact, you might not need to cook at all. If you’re fortunate enough to have some great family recipes that have received compliments over the years, write them out on attractive cards and tie them with a festive ribbon. These great gifts will spread the joy of delicious cooking throughout your circle of friends. Good deeds are gifts, too. Many of the people on your list may value a favor done for them more than any expensive present. Couples with young children would probably be delighted if you offer to babysit so they can have some time together. You can surprise a friend with a very busy schedule by promising to do the weekly shopping for a month. Present each recipient with a beautiful card describing the good deed to be performed. Such efforts cost nothing more than a few hours of your time, but they are greatly appreciated. Check your list twice. First, plan and purchase all you need for the lower-cost presents recommended here. Then, when you move on to higher-priced presents, keep an eye out for sales and comparison shop to get the best prices. You may find you can get the items on your list for less. *Representatives are registered, securities are sold, and investment advisory services offered through CUNA Brokerage Services, Inc. (CBSI), member FINRA/SIPC , a registered broker/dealer and investment advisor, 2000 Heritage Way, Waverly, Iowa 50677, toll-free 800-369-2862. Non-deposit investment and insurance products are not federally insured, involve investment risk, may lose value and are not obligations of or guaranteed by the financial institution. CBSI is under contract with the financial institution, through the financial services program, to make securities available to members. CUNA Brokerage Services, Inc., is a registered broker/dealer in all fifty states of the United States of America.